Sihanoukville (Khmer: ក្រុងព្រះសីហនុ - Krong Preah Sihanouk), also known as Kampong Saom, is a province (khaet) of Cambodia on the Gulf of Thailand. This port city is a growing Cambodian urban center, located 185 kilometres (115 mi) southwest of the Cambodian capital, Phnom Penh. The province is named after King Father Norodom Sihanouk and grew up around the construction of Sihanoukville Port. 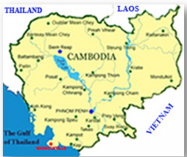 Construction on the port began in June 1955 and it was the only deep water port in Cambodia.The port was built in part due to the waning power of the French leading to the Vietnamese tightening their control over the Mekong Delta and hence restricting river access to Cambodia. Sihanoukville's beaches have made it a popular tourist destination. The province is served by Sihanoukville International Airport, 18 kilometres (11 mi) from downtown, although it has a limited commercial operation. The planned flights between Sihanoukville and Siem Reap may encourage visitors to Angkor temples in Siem Reap to extend their stay, though the crash of a charter flight in Phnom Damrey on 25 June 2007 from Siem Riep,has caused concerns. 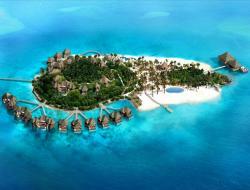 The flights are scheduled to start on December 14, 2011. Sihanoukville attracts tourists with its relaxed beach atmosphere when compared to Thailand's more developed ones. However, the city has attracted not only tourists, but several NGOs and foreign and national investors in the last years in order to develop not only the growing tourist industry, but its capacity as an international sea port and other sectors like textile and real estate.In Sihanoukville is also located the main factory of Angkor Beer, the Cambodian national beer. Sihanoukville was the place of the last official battle of the United States army in the Vietnam War, although the incident took place outside Vietnam. It is known as the Mayagüez incident on May 12–15, 1975 between the US forces and the Khmer Rouge. Currently, visitors dive in Koh Tang, one of the Sihanoukville islands where the major battle to free the SS Mayagüez took place. Divers can see two shipwrecks 40 metres (130 ft) down.